I know it has been a while since I watched the other two, but I have finally gotten around to watching Back to the Future: Part III. Let's just say, while it is a worthy sequel, it is not a patch on the first, or the second for that matter. Stranded in 1955 after a freak burst of lightning, Marty (Michael J. 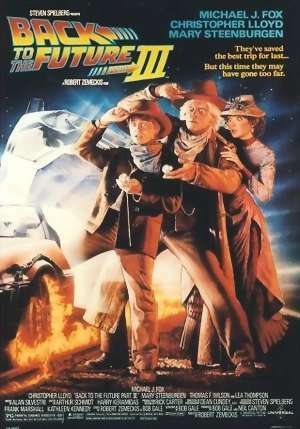 Fox) must travel to 1885 to rescue Doc Brown (Christopher Lloyd) from a premature end. Surviving an Indian attack and unfriendly townsfolk, Marty finds Doc Brown the blacksmith. But with the Doc under the spell of the charming Clara Clayton (Mary Steenburgen), it's up to Marty to get them out of the wild west and back to the future. At the start of this film, I thought it was going to be pretty stupid because it's portrayal of the west was very much like what you see in every other parody. However, once you get over how stupid this film looks on the surface, it is really enjoyable and entertaining. These films become like old friends to you, as you become well aware of what to expect from them. Forget the 3D antics of other films...the Back to the Future films are the quintessential family films that entertain every generation. While this film feels tired in some places, it does manage to capture the essence of it's predecessor. Unlike many sequels do, this film references the first films a lot so all of the films tie in together. Instead of feeling like three films, they feel like one big film split into three. Michael J. Fox is the best example of teen stardom in the 80's-early 90's, and these films make sure his legend lives on and isn't forgotten in this day and age. While the effects may be dated, this film will never go out of fashion. Not as good as the ones before it, but is still entertaining.